There are so many different hearing aids available today. With a wealth of information available online, it can be overwhelming to find the right one for you. We’re experts at hearing technology. We’ll make sure you get a hearing aid that’s customized for you. One that fits properly and works beautifully. Whether you’re new to hearing aids or you’ve been wearing the same one too long, we can help. Most providers are owned by a hearing aid manufacturer or have borrowed money from one. Other audiology practices purchase hearing aids through “buying groups,” where they must commit to a preset quantity of products. Either scenario presents a conflict of loyalties between you, the patient, and the manufacturer or buying group. We’re proud to be one of the very few completely independent audiology practices in Colorado and Arizona. Which means, our only loyalty is to our patients. Our entire focus is to ensure you get the best hearing aid for your health, your budget, and your preference. As a family-owned business, we have the pleasure and privilege of treating you like family too. At Sound Relief, we not only offer the most advanced technology available, our whole team is dedicated to making sure your experience is always exceptional. Daily wear hearing aids are worn during the day and taken out at night as needed. To determine whether a daily wear device will provide the right solution for your unique situation, schedule an appointment with Sound Relief Hearing Center to speak with one of our specialists. There are three basic styles of daily wear hearing aids: behind-the-ear, in-the-ear, and canal. They differ in size, placement, and the degree to which they amplify sound. Behind-the-ear (BTE) hearing aids consist of a hard plastic case worn behind the ear and connected to a plastic ear mold that fits inside the outer ear. The electronic parts are held in the case behind the ear, and sound travels from the hearing aid through the ear mold and into the ear. People of all ages use BTE hearing aids to assist with mild to profound hearing loss. In-the-ear (ITE) hearing aids, used for mild to severe hearing loss, fit completely inside the outer ear. A case made of hard plastic holds the electronic components. Because the custom-fitted casings must often be replaced as the ear grows, young children rarely use ITE hearing aids. Some ITE hearing aids contain added features, like telecoils. A telecoil is a small magnetic coil that allows users to receive sound through the hearing aid’s circuitry instead of a microphone. This feature makes it easier for users to hear conversations over the telephone and in public facilities that have installed induction loop systems (special sound systems that use a magnetic field to transmit audio signals). Many schools, airports, churches, and auditoriums have installed induction loop systems. Canal hearing aids, which fit into the ear canal, are available in two styles. In-the-canal (ITC) hearing aids are made to fit the size and shape of a person’s ear canal. Completely-in-canal (CIC) hearing aids, on the other hand, are completely hidden within the ear canal. Some newer models are nearly invisible. Both types of canal hearing aids assist with mild to moderately severe hearing loss. Although many appreciate their inconspicuously small size, others find the tiny devices difficult to remove and adjust. In addition, their limited space does not accommodate telecoils or larger batteries. This limits their power and volume, so they are not typically recommended for young children or people with severe hearing loss. The digital revolution has had a huge impact on the way hearing aids look, feel, and work. Some digital hearing aids are so small, they are virtually invisible. Others produce such natural sound, they mimic the way you heard sounds before experiencing hearing loss. At the moment, we believe that two manufacturers are outperforming their competition: Widex and Oticon. Both manufacturers use superior technology to design individualized devices, and they also test their products extensively before releasing them to the public. Dual Microphones: Dual microphones allow you to hear well in noisy situations. Some devices can even identify the source of a noise and reduce it! Open Technology: Open technology keeps the ear canal unobstructed, which eliminates that hollow, booming, “talking in a barrel” effect. Feedback Cancellation: This feature accomplishes exactly what it says it will. It cancels feedback before you hear it as an annoying whistle. Hands-Free Technology: With hands-free technology, your hearing aid will automatically adjust to your listening environment whether you’re on the phone, in a crowd, or out on a windy day. Computer Programming: You can program your digital hearing aid with a computer to ensure that it meets your individualized needs over time. Bluetooth Technology: Bluetooth technology allows you to hear your cell phone, home phone, and television directly through your hearing aids in stereo. There are four basic technology levels of digital hearing aid technology: economy, basic, advanced, and premium. Each level offers digital hearing solutions based on your level of hearing loss, lifestyle, and budget. Unlike most audiology practices, Sound Relief Hearing Center stocks many different hearing aids, so that our patients can try the devices outside of the office for a few days before deciding which option to purchase. We encourage you to use some hearing aids at home and work, to evaluate how they complement your daily life, before you commit to a particular device. To schedule a field trial without any obligations, schedule an appointment online or give us a call. We also offer hearing instruments that you can combine with sound therapy for tinnitus treatment and sync with your iPhone, like the Resound LiNX2. Though small, these devices are powerful and very easy to use. 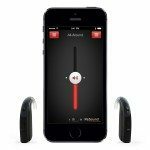 Please visit our iPhone Resound hearing aids page to learn more. Unlike daily wear devices, extended wear hearing aids can be worn for several months at a time without removal. They reside deep within the ear canal and suit people with mild to moderately severe hearing loss. Sound Relief Hearing Center is proud to be one of the select offices in the United States to offer Lyric, the first extended wear hearing aid that is 100% invisible. Unlike other hearing aids, Lyric is positioned completely inside the ear canal, where it uses your ear’s natural anatomy to funnel sound to your eardrum. This unique design and placement helps reduce background noise and feedback, providing exceptionally natural sound quality. In fact, Good Morning America featured Lyric in 2009, praising the device’s small size, discreet positioning, and remarkable sound quality. A trained hearing professional will place the hearing aid into the ear canal; no surgery or anesthesia is required. The deep placement within the ear canal allows the outer ear (the pinna) to direct sound into the ear canal naturally, reducing background noise and feedback. Once comfortably positioned, the device can be worn 24 hours a day. Lyric is not appropriate for all patients. To find out if you could benefit from Lyric, schedule a screening and risk-free trial with Sound Relief Hearing Center by contacting us online or giving us a call at 720-259-9962. To learn more, please visit our page dedicated to the Lyric hearing solution. A hearing aid can range in price from $750 to over $4,000 for each device. Every manufacturer sells their devices at different price points, and pricing is determined based on the level of technology – ranging from basic to premium. At Sound Relief, we offer four different levels, and hearing aid prices range from $1,650 to $3,750 per device. When purchasing a hearing aid, remember that you are not just paying for the device; you are also paying for our knowledge, expertise, and level of service. These factors will determine how much you benefit from a hearing aid. If you’re new to the world of tinnitus and hearing loss, we understand that you may find the plethora of options overwhelming. Would you benefit from a behind-the-ear hearing aid? What about an in-the-ear or in-the-canal device? Could Lyric be the right choice for you? Instead of trying to sift through the options on your own, consult with an expert. To get started, please schedule an appointment with Sound Relief Hearing Center today. Our audiologists can help you find a device that fits your level of hearing loss, positioning preference, and budget.